Winners, Pre-Orders, and a Giveaway!! The winner of the ARC of Confessions of a Royal Bridegroom is Teresa Kleeman. Congrats, and I’ll be in touch! Confessions is currently available for pre-order (it comes out April 1), and is listed at a really great price on Amazon–only $5.21! Included as a special bonus in Confessions, in both the print and digital editions, is Lost in a Royal Kiss, the novella which kicked off my new series. Pretty good deal, eh? Blurb, excerpt, and buy links for Confessions are listed on the Book Page. I wanted to let you know about another book that’s currently up for pre-order. 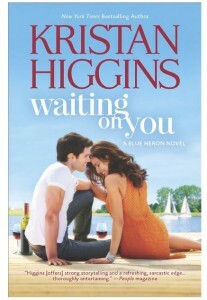 Kristan Higgins’ next book in her fabulous Blue Heron Series it out on March 25th. I’ll be buying Waiting On You because I know it will be a wonderful read, but there’s another reason to pre-order or buy the book during its first week in stores. As was true with Kristan’s last two releases, she’ll be donating a portion of first week sales and preorders to Fisher House Foundation, which provides housing for military families so they can be together when a service member or veteran is in the hospital. Even better, this time around Kristan’s publisher is matching the donations! Fisher House is a wonderful charity, and this is a great cause to support. I would encourage my readers to visit their website, and also hop on over to Amazon, B & N, or IndieBound to pre-order Kristan’s new book! And to get the ball rolling, I’ll be giving away a copy of Waiting on You to one lucky reader. Just tell me which causes and/or charities you like to support for a chance to win Kristan’s latest. I’ll pick the winner on Sunday night. Guest Author: Katharine Ashe & Giveaway!! I have several that I support. Caner being one of them and recently MS as I have a brother that has this. And I give to The Children’s Wish Foundation. There are a few more on my list.. I wish you and your brother the best, Kathleen! I always donate to the Salvation Army, also St. Jude’s and other Cancer places. That is one disease I wonder if they will ever find a cure for. I support my local Humane Society, The Shriner’s because they help my son with his missing hand, and The Autism Society because my son was diagnosed last year with Asperger’s Syndrome. God bless you and your son, Sheryl, and also these great charities! There are so many wonderful charities out there that it’s very hard to just pick one or two. Hubby and I always give to Breast Cancer, Wounded Warriors, St. Jude’s and our neighborhood food shelter. All fantastic, Dalila! I contribute to Wounded Warriors, too. So many wonderful charities, but I give to Habitat for Humanity and the Red Cross. Two charities who do so much, Marcy! I always support our local hospital with their Cancer programs since that’s something my family has gone through. I understand the importance of support groups and research so that a cure can be found. Along the same lines, I’ve grown out my hair a few times and donated my ponytails so they can be used to make wigs for chemo patients. That’s just something easy that I can do to help out with. That is very cool, Anita – good for you! !